Private-sector lender IndusInd Bank Ltd has terminated its agreement to acquire IL&FS Securities Services Ltd (ISSL) from debt-laden parent Infrastructure Leasing and Financial Services Ltd (IL&FS). In a stock-exchange disclosure on Tuesday, the Mumbai-headquartered bank cited unfulfilled conditions as the primary reason for calling off the deal, besides the decision by the newly-constituted board at IL&FS to initiate a new sale process of ISSL as part of efforts to move forward on a restructuring plan for the wider group. “The SPA (share purchase agreement) stands terminated as all conditions precedent were not satisfied within the stipulated time period,” read IndusInd Bank’s disclosure. IndusInd Bank, which is promoted by the Hinduja Group, had set the ball rolling to acquire ISSL in March last year. The bank then signed a definitive agreement to acquire 100% of IL&FS’ securities services subsidiary in June this year for an undisclosed amount. The acquisition was aimed at helping the private-sector lender scale up its capital markets business by bringing in specialised products besides getting access to over 1,000 broker client accounts, FPIs and FIIs, as well as the market value chain services like clearing, custody, depository and fund accounting. The deal had also received the Reserve Bank of India (RBI) and other regulatory approvals in September just when a liquidity scare erupted after IL&FS defaulted on a series of its debt instruments, causing redemption pressure at other non-banking financial companies (NBFCs). Incorporated in 2007, ISSL serves as a capital market intermediary for professional clearing, depository and custodial services. The firm services both retail and institutional clients, including 10,000-plus brokers, foreign portfolio investments and foreign institutional investors. The platform clocks one million transactions per day and is a clearing member on equity exchange traded derivatives. After the default on some its debt instruments, IL&FS’ shareholders approved a rescue plan to raise additional capital via debt and equity instruments. Its previous board had said the firm would develop a "comprehensive" restructuring plan to pay its dues through asset sales and a rights issue. India's Life Insurance Corp Ltd, IL&FS' biggest shareholder with more than 25% stake, had said that it would participate in the rights issue. IL&FS’ other shareholders include Japan’s ORIX Corporation, Abu Dhabi Investment Authority, Housing Development Finance Corporation, State Bank of India, Central Bank of India and Unit Trust of India. However, the government moved to take control of IL&FS by filing an application with the National Company Law Tribunal (NCLT) to remove the old board. It nominated 10 new directors, including Kotak Mahindra Bank managing director Uday Kotak as non-executive chairman. IL&FS and its subsidiaries have a massive Rs 910 billion ($12.55 billion) debt pile. A collapse at IL&FS could potentially spark the collapse of many other players in the Indian NBFC space. The private-sector lender announced the acquisition of microlender Bharat Financial Inclusion Ltd (formerly SKS Microfinance) in a stock deal in September 2017. The deal was concluded in June 2018, after stock exchanges approved the transaction. Previously, in April 2015, IndusInd had acquired the diamond and jewellery financing business and related deposit portfolio of Royal Bank of Scotland NV in India. The size of the portfolio was about Rs 4,100 crore. In 2011, it had bought Deutsche Bank’s loss-making credit card business in India for an undisclosed sum. 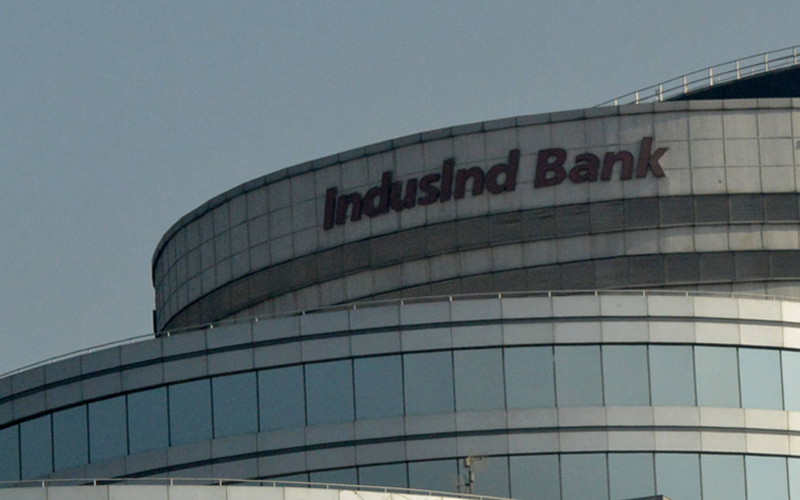 IndusInd Bank, founded by the London-based billionaire Hinduja brothers, commenced operations in 1994. It caters to both consumer and corporate customers. The bank has 1,466 branches and 2,372 automated teller machines (ATMs) for cash deposit and withdrawal transactions as on September 2018. The bank had deposits of Rs 1.68 trillion at the end of September, according to its quarterly earnings report.